The Canelli’s area includes the municipalities of Canelli and Calosso, in the Province of Asti and Santo Stefano Belbo, in the province of Cuneo. This land represents the production center’s excellence of Asti Spumante, deriving from the processing of White Moscato. 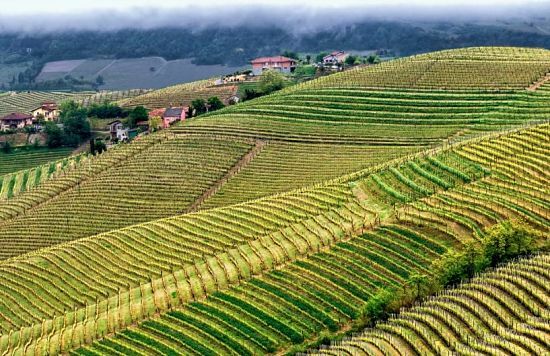 Asti spumante is a variety historically attested in Piedmont Region, where peculiar environmental conditions have allowed its spread and tied intimately the production of its aromatic grapes to these places. From the White Moscato is also produced the Moscato d’Asti, a sweet wine, not sparkling. The Italian word “Moscato” appears in the second half of 1200. The meaning of “perfumed”, however the earliest evidence relating to the vine variety’s cultivation date back to the XIV century. In 1600 it was considered among the white grapes “most excellent” in Piedmont and in the following century some specialized books include the “White Moscato” of Piedmont among the finest vine varieties. At the end of the eighteenth century the prestigious Agriculture Society of Turin, marked the Moscato as one of the Piedmontese vine variety able to produce the finest wines. in 1800, an important century for the evolution of viticultural and winemaking knowledge, thane variety becomes an important protagonist of the Piedmontese wine making. From those years, Canelli and Asti have became excellence areas for the cultivation of this variety, in particular the first was characterized as the historical capital the “White Moscato“, widely known just as “White Moscato of Canelli“. The territory of Canelli and the Valle Belbo are the natural scenery of some of the major works of Cesare Pavese and often farms, rural villages, hills are the setting of the story of his most famous characters. The farming reality, the vineyards on the hills and the small villages recur frequently in the novel “La Luna e i Faló” , which contains autobiographical references to the author’s life, born in Santo Stefano Belbo at the beginning of the century. Canelli is located at the mouth of the valley of the Belbo river, on a small plain located among the last extensions of the hills of Monferrato and the hill slopes of the Langhe.The name comes from the Latin “cannula”, which indicated the reeds that still grow on the banks of the river Belbo. Some tombstones from the Roman period found in Canelli document a rural settlement, subordinated to the center of Aquae Statiellae (Acqui Terme), whose importance was related to traffic street Aemilia Scauri, that linked this area to the Ligurian coast near Savona. The settlement has two distinct urban sectors: the “Villanuova” grew around the old cestrum, on top of a small hill in the north-east of the town, and the “village”, formed by successive layers below the medieval castle. The medieval urban fabric, densely built and closely connected to the serpentine paths, runs along the hill’s slope, where on top emerge the most valuable buildings from an architectural point of view. 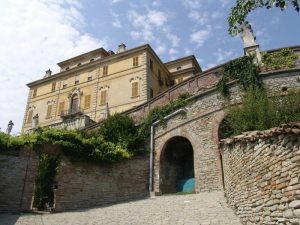 The most significant is the castle, now Gancia Palace , whose first records date back to the Xl century, which owes its present appearance to the seventeenth century’s reconstruction and to a major restoration in 1929 by the architect Arturo Midana. He wanted to grant the castle a late seventeenth century’s style, for both exteriors and interiors, where a careful research of the period gave to these structures a harmonious variety of furnishings. The painter’s decorations Giovanni Olindo of Canelli, and numerous polychrome stuccos, recall the baroque current. Externally, two wings were added making the building most impressive. Corner and median pilaster strips break the construction’s compact, while sides and protruding bodies are simpler. Also significant was the arrangement of the surrounding areas, in particular the creation of the Italian garden brings the Castle back to past the splendor. The Castle is a scenic landmark and represents the symbol of the city of Canelli. The parish church of San Leonardo is located very close to the castle and was also reshaped in Baroque style on the site of the ancient church of San Michele. In ancient times the facade was painted with intense tones and decorated with allegorical figures of Faith and Charity, now disappeared. The plant has a single nave flanked by two pseudo-aisles consisting of side chapels. 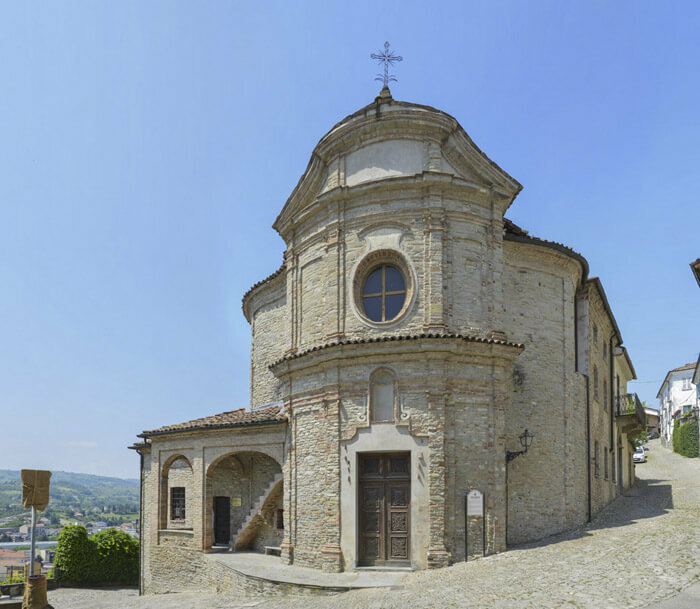 Not far away, nearby the underlying village, is situated the church of San Tommaso stood since the Xl century and rebuilt in the Xvll century. But to make this territory really unique, are the famous “Underground Cathedrals”, the historical wine cellars of Canelli that wind for kilometers under the city’s historical center. The underground cathedrals are so called because of the majesty of their vaulted rooms, that recall the churches’ aisles. They were dug from the XIX century in the basement of Canelli’s city center and represents real masterpieces of engineering and architecture. 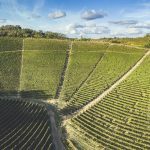 Here the presence of a substrate formed of calcareous tuff perfect natural heat insulator capable of maintaining a constant temperature of 12-14 degrees – has made this site than ever ideal for processing and finishing of sparkling wine. 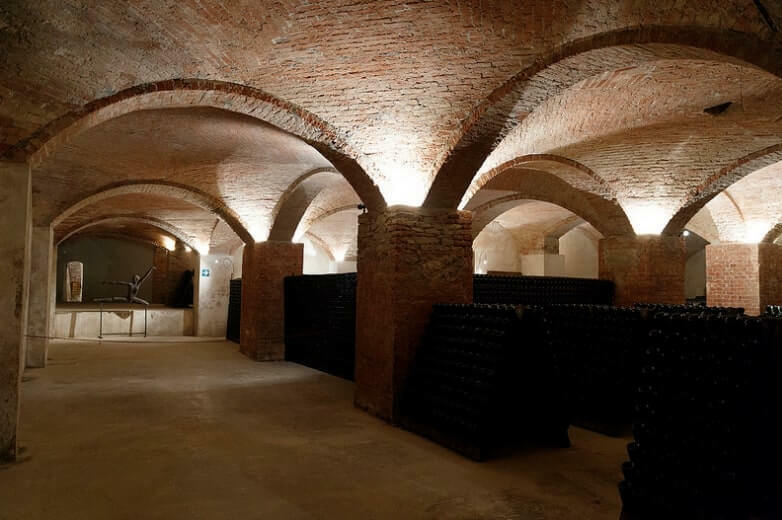 The ‘cathedrals’, also often designated to real museums open to the public, are characterized by huge areas divided into local that support the production and wine cellars for the wine ageing covered with barrel or sail vaults and developed on multiple levels tens meters deep. The Canelli Virtual Museum of winemaking History and Piedmontese Wine-mechanics is at the enhancement of the sector related to the wine industry, largely concentrated in Canelli’s surroundings, promoting at the same time historical research and technological innovation, retrieving and cataloging the documentary heritage in the field, and making it accessible to visitors and scholars. 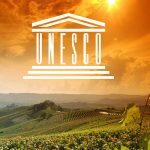 Multimedia Museum of South Asti – which tells the 150th anniversary of Italian wine vocation, through a guided tour aimed to communicate a life’s philosophy and a farming culture that, over time, has become entrepreneurial. 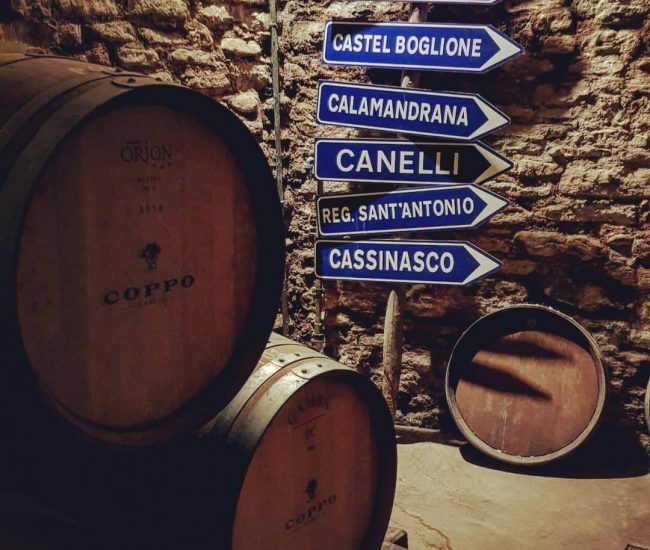 In Canelli takes place every year the event “Canelli città del vino” – (Canelli wine city) which promotes the white Moscato through the evocation of nineteenth century grapes’ pressing and a visit to the wine cellars. 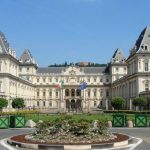 Among the organizers of this event ranks the Regional Wine of Canelli and of Astesana that, situated in the nineteenth-century extension of the city, is a showcase for large manufacturers of white and red wines of Asti land. The Winery was founded in 1997 and recognized by the Piedmont Region in accordance .with the LR. 37/1980. It currently has 52 members, of which 45 are private, which include the main wineries of Canelli and surroundings, and 7 public members, represented by the municipalities of Canelli, Calamandrana, Calosso, Cassinasco, Moasca, San Marzano Oliveto, Vesime and the Community of the Hills between l.anga and Monferrato located in Costigliole d’Asti. What to sleep in Canelli? 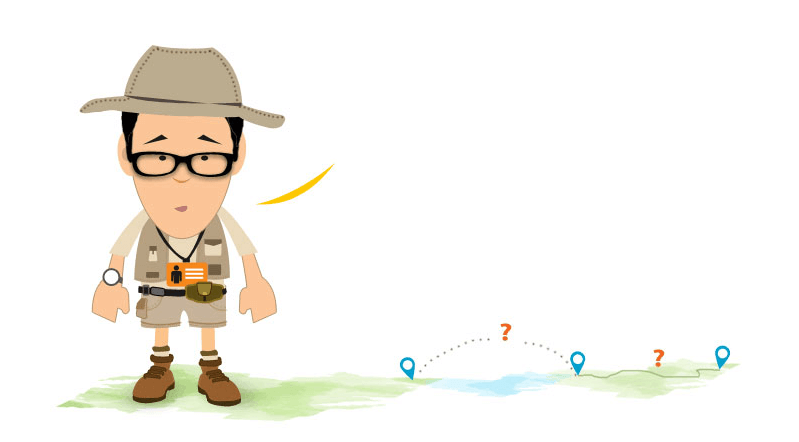 Discover Wineries, Vineyards, Private Wine Tours, Truffle Hunting & What to do in Canelli, Monferrato, Piedmont, Italy.